The winning ticket for April 23, 2019. Congratulations Kristin Jacobson, is our April 23 Winning Ticket Winner. How it works...The winning ticket basket changes every week. You can get a ticket for every purchase when you come into the store. A random ticket is drawn from the previous weeks receipts and is posted at 10am Tuesday. The number expires at 10am the next Wednesday. You never know what you could win. Tickets are eligible for one drawing on the following Tuesday. Good LUCK! Thanks for participating. If you love getting discounts and fun inspiration join our text club. 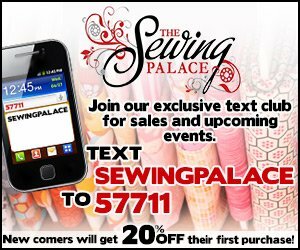 Text SEWINGPALACE to 57711. View our Current Newsletter-Click Here.